Forget seven degrees of separation. In indie movies, New Yorkers are only separated by two or three degrees. Therefore, paths are bound to intersect. Mercifully, Dustin Guy Defa does not belabor the near-missed connections and tangential relationships in the day-in-the-lives of interconnected New Yorkers. 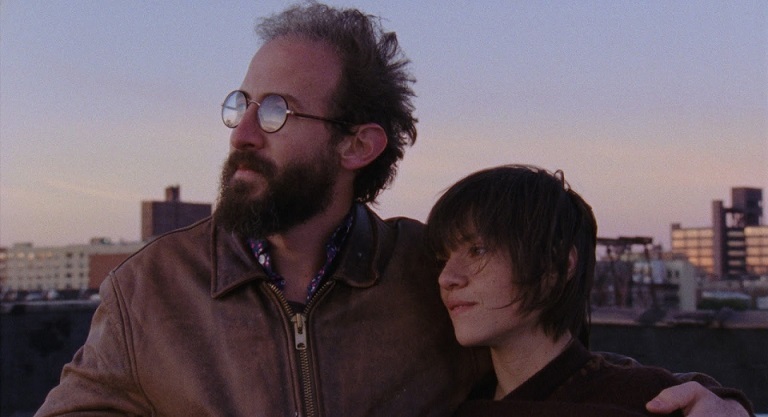 Still, there is apparently no better city to be hip and dumb, judging from Defa’s Person to Person, a feature riff on his similarly titled short film, which screens during the 2017 Sundance Film Festival. Real life Red Hook record store owner Bene Coopersmith is the interesting exception to everything above. His namesake Bene is a likable record collector (aren’t we all? ), who has a line on a rare Charlie Parker record. However, when the seller has passes off a knock-off, Bene pursues the villain for the sake of justice for all vinyl junkies. Meanwhile, Bene’s temporary roommate Ray must figure out a way to apologize to his probably ex-girlfriend for posting naked pictures of her on the internet. Good luck with that one. Across town, Phil, a bottom-feeding tabloid reporter is trying to train Claire in the practice of unethical journalism. They are working the case of a suspicious widow, who left her late husband watch to be repaired at Jimmy’s shop, earning him visits from the police and the reluctant Claire. To round out another day of sun in New York, we periodically check in with the sexually ambiguous Wendy, who might somehow be attracted to the best pal of her roommate’s boyfriend, who just so happens to be a guy. On one hand, we want to give Defa credit for namechecking Parker and including some of his music on the generally terrific soundtrack. Yet, it sort of nags at us that it is not so true to the jazz record collecting experience. Everybody respects Bird’s artistry, but his records are not particularly collectible, because even in his day, they pressed considerable quantities. It would have been more realistic if the con involved a rare mono Blue Note. Regardless, Coopersmith has boundless energy and an air of sincerity that is quite refreshing. His scenes have plenty of vigor and zip. In contrast, as Phil the “journalist,” Michael Cera basically amalgamates and exaggerates all the annoying shtick of his previous neurotic characters. Crafty Philip Baker Hall adds much needed gravitas as Jimmy the watch repairman and Tavi Gevinson is also surprisingly intriguing as Wendy, even though her story arc is the least developed. Arguably, Person to Person the feature demonstrates why Defa is so well regarded for his short films (several of which also feature Coopersmith as Bene). There are some finely rendered discrete moments, but the whole is uneven and off-balance. Mostly endurable and largely inoffensive, Person to Person screens again this afternoon (1/21), Thursday (1/26), and Friday (1/27) in Park City and Tuesday (1/24) in Salt Lake, as part of this year’s Sundance.